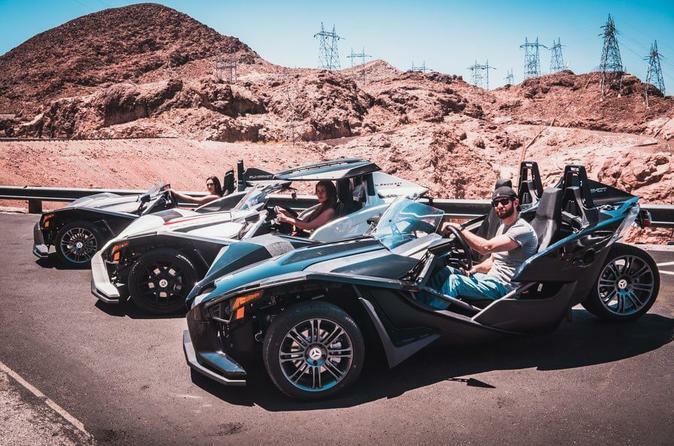 Take the driver’s seat and experience the ride of a lifetime while driving a 3-wheeled, open aired Polaris Slingshot better known as the “Batmobile!” …or take the passenger seat and buckle up, sit back, relax and enjoy the breeze & awesome views. Sin City Moto tour guides will accompany you on a journey of excitement and adventure that you will be sure to remember for years to come. First, stopping in Historic Boulder City, home of the Hoover Dam where you can shop for souvenirs, grab a snack, and take in the sights. Then, travel along the beautiful scenic curves of Lake Mead with a brief stop at the Lake Mead lookout, you will be able to see the famous Hoover Dam from afar and check out the Mike O’Callaghan-Pat Tillman Memorial Bridge. Plan for plenty of photo opportunities as our guides present you with tidbits sure to interest you. On to the world-famous Hoover Dam walkway, where excitement awaits you. Look out onto the Dam, walk across the bridge and be in two states at once! Take the driver’s seat and experience the ride of a lifetime while driving a 3-wheeled, open aired Polaris Slingshot better known as the “Batmobile!” …or take the passenger seat and buckle up, sit back, relax and enjoy the breeze & awesome views. Sin City Moto tour guides will accompany you on a journey of excitement and adventure that you will be sure to remember for years to come. First, stopping in Historic Boulder City, home of the Hoover Dam where you can shop for souvenirs, grab a snack, and take in the sights. Then, travel along the beautiful scenic curves of Lake Mead with a brief stop at the Lake Mead lookout, you will be able to see the famous Hoover Dam from afar and check out the Mike O’Callaghan-Pat Tillman Memorial Bridge. Plan for plenty of photo opportunities as our guides present you with tidbits sure to interest you. Then on to the world-famous Hoover Dam walkway, where excitement awaits you. Look out onto the Dam, walk across the bridge and be in two states at once!